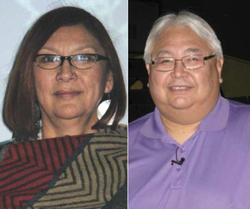 On December 17, 2014, the young people of Nipisihkopahk High School in Maskwacis, AB, filed into their auditorium to listen to two significant speakers for the second forum hosted by the Keep On Learning Foundation. Maskipeton was found in a dugout as an infant, yet just over a quarter century later, in 1834, Maskipeton was invited along with other headmen to visit US President Andrew Jackson. The President wanted to send a message back with the leaders that their territories were about to be settled and to prepare them for the reality that changes were coming. During this tumultuous era, Maskipeton would become a sought after guide by many of these people who were traveling through the area and/or setting up homesteads. Beverly Crier focused on a letter written to Reverend Robert Rundle who established a mission post around Pigeon Lake. Maskipeton clearly respected the Reverend, and asked him to educate his son Benjamin, teaching him ‘high English’. In return, he offered Reverend Rundle 160 buffalo. In this newly forming frontier, this exhibited a very progressive attitude, revealing the value Maskipeton placed on education, to prepare himself and his family for the future. Beverly used the example of Maskipeton, a ‘grandfather’ to the young people seated before her, to challenge them to know who they are, and to follow his example in preparing themselves for their future. Following Beverly Crier was professional photographer and, ‘Digital Storyteller’ Bert Crowfoot, great-great-grandson of the legendary Blackfoot Chief Crowfoot. Bert has spent the last 31 years in media, establishing three provincial aboriginal newspapers located in BC, Alberta and Saskatchewan, establishing the first aboriginal radio station in Alberta, as well as being the founder of the Aboriginal Multimedia Society of Alberta. Between Beverly and Bert, the Nipisihkopahk high school students were challenged to be all they could be, set high goals and take every opportunity to prepare that they can along the way. Felisha Hosein Crier, founder of The Keep On Learning Foundation, plans on hosting similar forums over the next few years. This progressive attitude towards equipping young people for their future is in itself an example of that which made Maskipeton an influential figure and role model for youth to look up to.